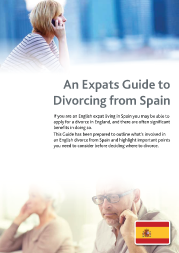 If you are originally from England or Wales but now live in Spain you may be able to divorce in England. Using the English courts is often quicker, cheaper and less complicated than divorce through the Spanish courts. Woolley & Co, Solicitors are based in the UK but are experienced in international divorce and normally able to handle your whole case without you needing to return to the UK. For confidential legal advice from an approachable, trusted divorce lawyer call Woolley & Co, Solicitors on (+34) 9511 20555. Or complete our online form with your telephone or Skype details and we’ll call you.